FC Barcelona secured the top spot in their Champions League group following their 2-1 victory over PSV in Eindhoven. Messi gave the Blaugrana the lead in the 60th minute after a nice exchange with Ousmane Dembélé saw the great player elude and evade four PSV players before lifting the ball past PSV’s keeper Jeroen Zoet. Ten minutes later, Messi then helped Barça get the insurance goal when his free kick struck Pique, who managed to divert the ball beyond Zoet. Luuk de Jong’s headed in a consolation goal in the 83rd minute. 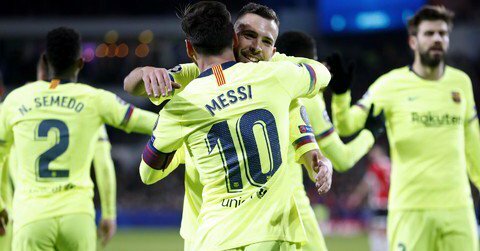 The result meant that FC Barcelona finish as group winners in the Champions League for the 12th consecutive season and the 20th time overall in club history. Barça will now wrap up the group stage on December 11 when they host Spurs who need to have a better result than Inter in order to advance. The Blaugrana will now shift their attention to their league campaign when they host Villarreal on Sunday and try to get back to their winning ways after failing to secure a victory in their last two league outings. PSV: Zoet, Dumfries, Schwaab, Viergever, Angeliño, Rosario, Hendrix (Gutiérrez, 71′), Lozano, Pereiro (Malen, 71′), Bergwijn (Romero, 79′) & Luuk de Jong. FC BARCELONA: Ter Stegen, Semedo, Piqué, Lenglet, Jordi Alba, Rakitic, Sergio Busquets, Vidal, Dembélé (Denis Suárez, 80′), Messi & Coutinho (Malcom, 69′). Goals: 0-1, Messi (60′); 0-2, Piqué (70′); 1-2, De Jong (83′). Referee: Pavel Kralovec (Czech Republic). Cautions: Hendrix (25′), Gutiérrez (83′), De Jong (84′)/Alba (85′) & Piqué (90′). Next PostBarça league leaders again after beating Villarreal 2-0.